Windows Home Server MVP Nick Asseloos of ASoft, the creator of many popular Add-Ins for Windows Home Server, has now released AutoExit 2010 Beta-1 for Windows Home Server Vail. This add-is contains the same features of AutoExit for Windows Home Server v1 but this is of course for Vail. 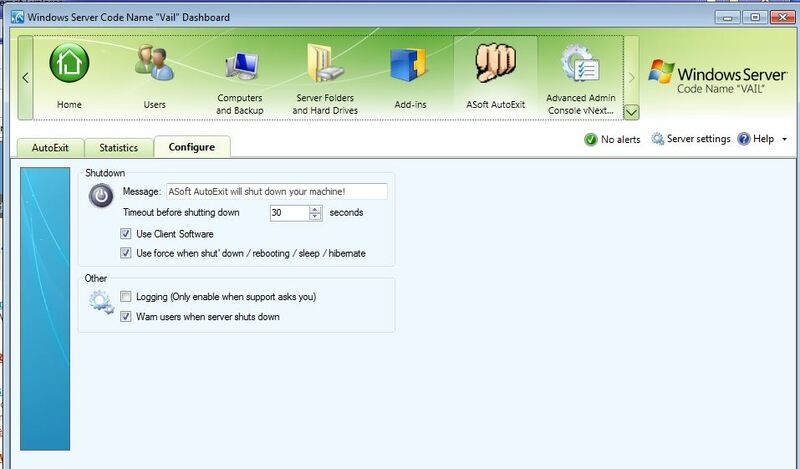 AutoExit 2010 for Windows Home Server code named Vail can be used to shut down and reboot the clients on your home network. It can also be used to set your clients to sleep or be placed in hibernation and can use Wake on LAN or WOL to wake up those same clients. One very nice feature is the ability to shut down all your clients, which is handy for when you’re away and thunderstorms are reported in the area of your home or for whatever reason you may have. Of course you can shut down a single client but the ability to shut them all down is very nice. AutoExit also allows you to log off an existing user from a client and to lock the client. 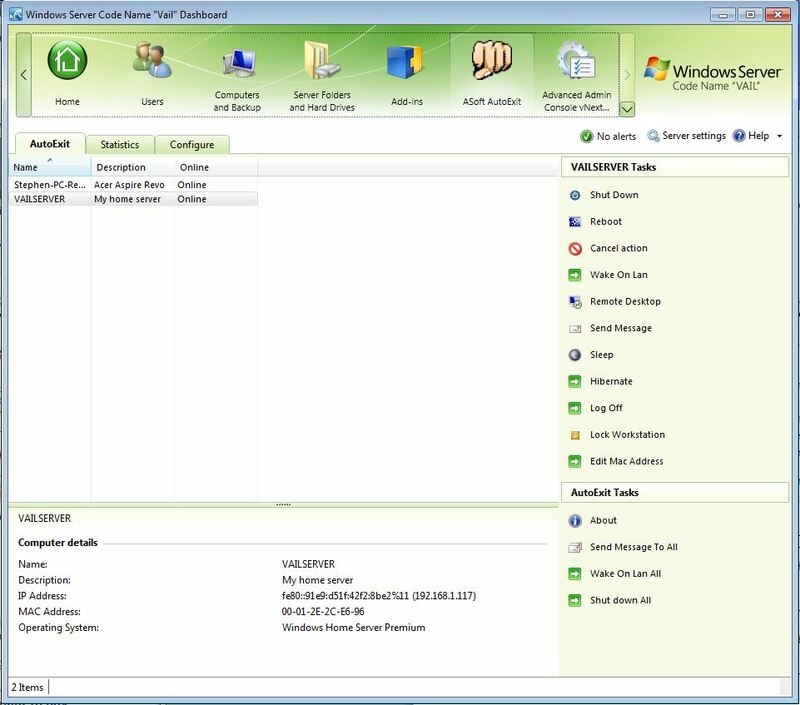 There is a Remote Desktop feature to allow you to establish a RDP Session with a client. Other features include the ability to send messages to clients on your network, ability to configure time out messages to warn users when the server will be shutting down and the Add-In also keeps statistics for all actions so that a detailed log is created when certain actions are executed. One thing I appreciated very much was the documentation provided with the Add-In, which I found to be simple to follow and detailed. I really can’t stress how important this is, however if you have run AutoExit in the past you should feel right at home with this version for Vail. If you’re not familiar with it then review the documentation and you will have it functioning very quickly. It’s important to note that some of the functions may not work with certain clients either because the client hardware doesn’t support the WOL feature or because some versions of Windows do not support RDP Sessions. All this is documented in the guide that comes with the software so please take the time to review it to see how this affects the different clients on your home network. Also there are instructions on how to set up the WOL functions on clients which support WOL and how to configure a client to accept RDP Sessions but this part is dependent on which version of Windows your client has installed on it. This is a beta so if issues are found Nick would like for you to report them so he can address them. 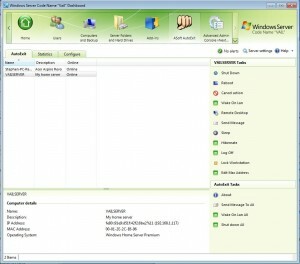 New version of AdminMe 2010 for Windows Home Server Now Available!